It is sad to think that for several generations the name ‘Drayton Manor’ invokes images of a popular theme park. However, this wasn’t always the case and until the 1920’s was famous for being a grand mansion, the family seat of the Peel lineage. The Drayton Manor estate was sold to Robert Peel (1750-1830), a farming and textiles man from Lancashire, about 1790. He was made a Baronet in 1800, but it was his son, Robert (1788-1850), that brought the greatest honours to the family. He became Prime Minister to Queen Victoria and, as Home Secretary, had created the London Metropolitan Police Force. Shortly after becoming 2nd Baronet he set about building a new mansion, 30 yards away from the old hall, and adopting designs from Sir Robert Smirke (1780-1867), the architect behind Covent Garden Theatre, Lansdowne House and the British Museum. Building work started in 1831 and was completed at a cost of £50,000 in 1833. It was a quadrangular stone mansion, in the Elizabethan style, of considerable extent, but without any ostentatious display of architecture, either internally or externally. A large corridor, or gallery, in the centre of the building, had its walls covered with fine works of art, as well as almost every available space on the staircase and elsewhere; and it was to his credit that almost every picture was by a famous painter. Its crowning glory was a visit by Queen Victoria and Prince Albert in 1843. The art collection grew so quickly that Smirke’s younger brother, Sydney Smirke, returned in 1846 to build a new gallery wing to the north-west angle of the mansion, extending westward for about 100 feet. The exterior was embellished with statues of Rubens, Vandyke, Sir Joshua Reynolds and Sir Thomas Lawrence. Robert Peel, 2nd Baronet, died in 1850 and the estate passed to his son, another Robert Peel (1822-1895), who managed the estate in a robust manner. It was said of him that his greatest misfortune was in being the son of his father. An eloquent speaker, a fine presence, a daring actor, very irritable and impatient, he was unable to forget that his father had been Prime Minister. He also had to contend with a darkening cloud of the horizon in the shape of his son, yet another Robert Peel (1867-1925), who rebelled against the values that his grandfather, the 2nd baronet, had established. A bit of a fool; a man without a conscience! Robert Peel, the younger, had served as a Lieutenant in the Staffordshire Yeomanry, wrote two books – ‘A Bit of a Fool’ and ‘An Engagement’ – but his standing in society could not protect him from a weakness for gambling. Here was a man who had ‘broken the bank’ in Monaco netting no less that £12,000. However, his losses were greater than his winnings, and in 1893 had been declared bankrupt. When his father, the 3rd Baronet, died in 1895 he might have been forgiven for thinking his problems were behind him. However, just three years later he was a confirmed bankrupt for a second time. It happened again in 1901, 1903 and 1910, each time managing to avoid paying back any of his creditors. His marriage to Mercedes, daughter of Baroness de Graffenried, of Switzerland, in 1897, might have provided respite but it was a false hope. For the rest of his life Sir Robert, still unwilling to pay back creditors, couldn’t escape the financial burden. In 1911 he declared that he had severed all connections with Drayton Manor and wrote an open letter to his tenants thinly explaining his reasons. It was a deception because he never actually left the house. When war was declared in 1914 he offered Drayton Manor as a sanatorium or hospital to naval and military authorities, but was most likely a feeble attempt to delay the inevitable. In July 1917 Mr Justice Sargeant directed that the remaining contents of Drayton Manor should be sold by public auction. For the next year the Peel treasures were sold off piece-meal – “The fine things which Sir Robert Peel (2nd Bt.) collected with such care and taste have been dispersed by those who came after him.”² In November 1917 the family estates in Lancashire, Warwickshire and Staffordshire were put up for sale. The Drayton Manor estate was sold off in lots in 1919, but mysteriously the mansion was withdrawn at the last-minute. A troubled Sir Robert Peel died at Drayton Manor in 1925. The remaining portions of the original estate were offered at auction in April 1926, the mansion being sold to Mr G.H. King of Aberdeen for £6,780 who also bought the adjoining stables for £400. Later that year demolition work began with speculation that the site of the mansion-house and the park farm adjoining might be developed as a garden city. In 1931 Mr D. R. Fox, a well-known Lichfield sportsman and garage proprietor, bought the grounds and gardens of Drayton Manor and converted them into pleasure grounds. For the next eighteen years they proved to be a popular tourist attraction with two lakes, spectacular gardens and a café. They passed into the ownership of Mr Charles Deakin who, in 1949 announced that he was negotiating a sale to Mr and Mrs George Bryan, whose family had experience running a similar facility, ‘California-in-England’, near Wokingham. They proposed to restore the grounds to their former beauty and to add many new innovations. The rest, as they say, is history! The treasures from Drayton Manor were scattered far and wide. In 1928 it was reported that a bath from Queen Victoria’s visit in 1843 was on display at the Crane Co showrooms, next door to the New Convention Hall, in Atlantic City. 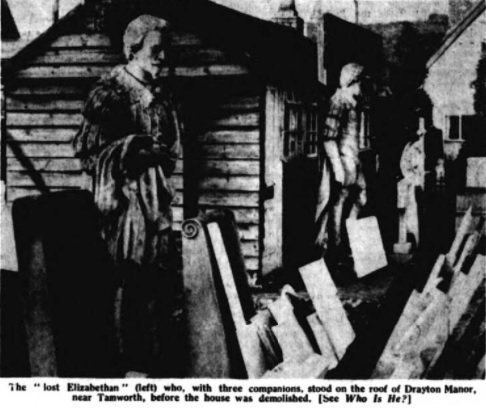 In 1961, the Birmingham Daily Post, reported on four sculptured figures found at Messrs. Bateman Ltd in Knowle. These had stood on the roof at Drayton Manor and were sold in 1926 to the then owner of the salvage yard. In the catalogue these had been described as Sir Walter Raleigh, Sir Isaac Newton, Sir Joshua Reynolds and the younger William Pitt. However, according to the newspaper, two of the statues appeared to be Elizabethan figures, speculating that the nearer one might have been Sir Francis Drake. ¹Birmingham Mail. 7 December 1914. ²Tamworth Herald. 27 October 1917. ³Tamworth Herald. 9 April 1927.